The disadvantages are that it costs money to obtain and verify a certificate from a Certificate Authority, and it takes some time to configure. Hopefully, this blog post will help to reduce the amount of time necessary to configure SSL with Maximo. Please note that you can also create a self-signed certificate which will suffice in forcing the browser traffic to be encrypted. However, users will see that the certificate is not trusted in the browser, and it might lead them to ask questions or not trust the connection. This article will take you through setting up Maximo with SSL through a GoDaddy SSL Certificate, which is currently ranging anywhere from $50.00 to $300.00 annually based on the level of encryption, features, and number of sub-domains you want to secure. We will use the most basic single-domain option for this exercise. Sign on to the server where the IBM HTTP Server is installed as an administrator. 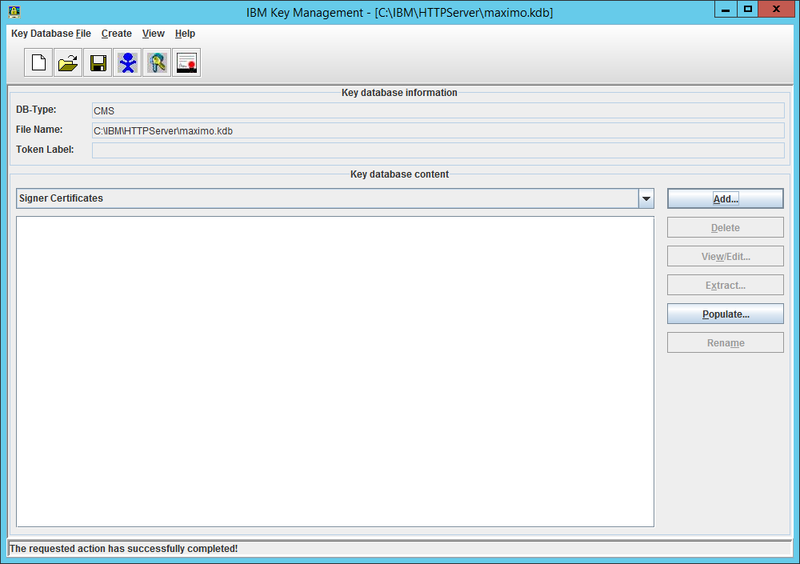 Click OK. We’re going to leave the IBM Key Management Utility open for now. We’ll come back to it later. Navigate to the SSL Certificate page on the GoDaddy website and purchase an SSL Certificate (sorry, no step-by-step here!). Select Provide a CSR, and then enter the CSR from your server. Back on the server where the IBM HTTP Server is installed, open the C:\IBM\HTTPServer\maximo.arm file in your favorite text editor. Copy its contents. This is your Certificate Signing Request (CSR). GoDaddy will verify your certificate request. How long this takes depends on the type of certificate (typically between 1 and 7 days). Once we have that certificate we can continue with the process. Until then, we wait. After GoDaddy approves your SSL certificate request, you can download your primary and intermediate certificate from within the SSL application on the GoDaddy website. Select the Apache server type. Copy the ZIP file to the C:\IBM\HTTPServer\ folder on the server where the IBM HTTP Server is installed. Extract the contents of the ZIP file to the C:\IBM\HTTPServer\ folder. Note that there should be two files: one that represents your certificate, and one that represents GoDaddy’s intermediate certificate. You will need both to install the certificate in the next step. 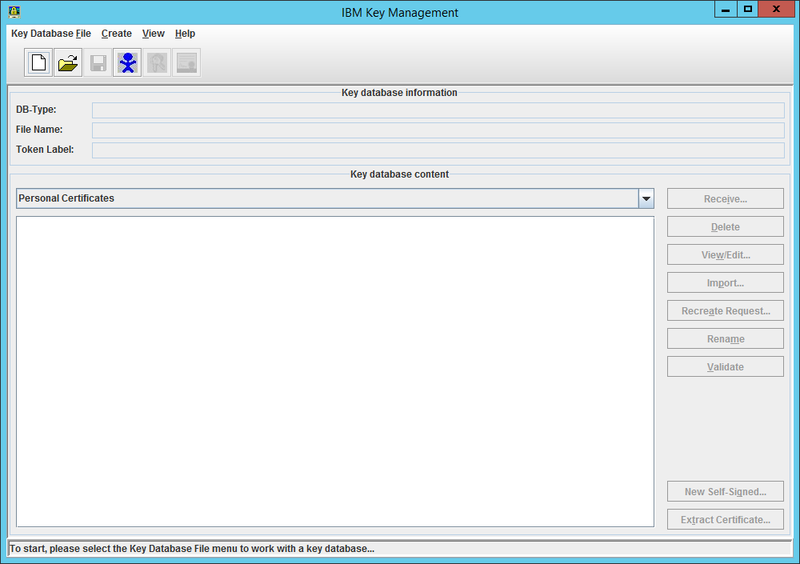 Open your maximo.kdb key database created earlier, using the password you created earlier to unlock the key database. Change the Key database content drop-down to Signer Certificates. Choose the intermediate certificate file that you extracted in the previous step. Please note that the file name is likely to be of the nature gd_bundle_*.crt, and that the CRT file extension is not in the default list in the Key Management Utility file browser. Simply change the file extension drop-down to All Files or paste the exact file name into the window. You should see the intermediate GoDaddy certificates listed. Change the Key database content drop-down to Personal Certificates. You should see the MAX_SSL_KEY record that was created earlier when we created our CSR. Highlight that record. Note that the * in front of the MAX_SSL_KEY record indicates it is the default key. Choose the certificate file that you extracted in the previous step. Please note that the file name is likely to be some has sequence with a file extension of .crt, and that the CRT file extension is not in the default list in the Key Management Utility file browser. Simply change the file extension drop-down to All Files or paste the exact file name into the window. 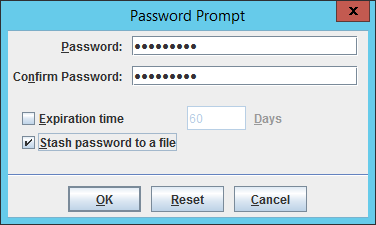 If all goes well you should see a Validation Successful message in the Key Management Utility! This means that your key database is now validated with a signed certificate from a Certificate Authority (GoDaddy). We’re almost done! Edit the C:\IBM\HTTPServer\conf\httpd.conf file. Please note that the directory path may be different based upon your installation (e.g. C:\Program Files\IBM\HTTPServer\). Restart the IBM HTTP Server V8.5 Windows Service. Log into the IBM WebSphere Console as an administrator. Navigate to Environment > Virtual Hosts. Click on the maximo_host Virtual Host. Click on Host Aliases under Additional Properties. Add the host name that you used for the Common Name (e.g. www.mycompany.com) in your certificate request as the Host Name. Specify 443 as the Port. Click OK and save the configuration to the Master File. Restart your IBM WebSphere Windows Services (Cell Manager and Node Agent). At this point, you should be able to access Maximo over SSL (HTTPS). There are just a few System Properties that should be updated in order to have everything buttoned up. Log into Maximo as an administrator. mxe.doclink.path01: This is for attached documents. mxe.help.protocol: This is for application help. Please note that in 7.6.0.4 the help is now pointing to IBM’s website. In the case where you have 7.6.0.4 or later pointed to IBM’s website, leave the protocol as is (http). mxe.int.webappurl: This is for Integration Framework web service and HTTP calls. mxe.oslc.restwebappurl: This is for OSLC calls through the REST interface. mxe.oslc.webappurl: This is for OSLC calls through the standard interface. That’s it! I hope this has been helpful. Please feel free to leave feedback in the comments section below. Great article, very concise and informative. Do you have any further steps in order to only allow TLS 1.2 as the transport protocolo on SSL? Your article is quite good. Do you think it is advisable in this situation to configure access such that ssl is the only/mandatory connection available? Is there some way to encrypt the mxe.report.birt.viewer? If you have a BIRT Reporting Only Server (BROS), you can secure that environment in a similar fashion. Then update your mxe.report.birt.viewerurl System Property to use the HTTPS protocol. A Big Thank you for making this concise instructions. Are there any special considerations for Maximo clustered environment in enabling SSL? You’re welcome! For a clustered environment, the key is securing the load balancer URL and then ensuring that the Virtual Hosts are configured properly. You do not need certificates for each host within the cluster. You simply need to establish trust with the load balancer. Is it possible to use wildcard SSL certificate with Maximo? Yes, a wildcard certificate can be used with Maximo. Most of the SSL certificate providers will provide a way to specify your list of sub-domains for wildcard certificates. Other than providing the Maximo sub-domain to the provider, the steps should be very similar to what’s been listed in the article. Hi Alex, Thanks for sharing such a useful article. Can you please help me with the below problem? I am getting invalid certificate when running a BIRT report. The BROS application is mapped to the BROS JVM and webserver1. A certificate is usually only valid for a given domain name. In other words, you will need two certificates – one for maximo.xyz.ca and one for maxrep.xyz.ca. The exception is that some providers offer wildcard certificates, where one certificate can match *.xyz.ca. In your case you will need two certificates or one wildcard certificate to secure both maximo.xyz.ca and maxrep.xyz.ca. The setup above can be followed for both JVMs. Good luck! We are using wildcard certificate i.e. *.xyz.ca. I am able to get around the invalid certificate problem by deploying the BROS EAR to a webserver running on the same VM as BROS JVM. But this approach then allows users to login to maximo using the maxrep.xyz.ca url as well which I dont want to happen. we need to call a secure webservice from Maximo using publish channel. Do I have to import certs in websphere? Yes, certs need to be imported into the trust store within WebSphere. Look for an article shortly on this topic! It took a little longer than expected, but the article about importing certificates into WebSphere’s trust store is now online.